In addition to a pain-free procedure, the goal is also to eliminate any fear or discomfort your dog or cat may be feeling. Our companion animals live in the present moment. If they feel the loving presence of their family and have no anxiety about anyone new in the home, they will feel secure and cared for. Dr. Rowell will take whatever time is necessary with your cat to allow him or her to feel comfortable. It is recommended that we utilize the room or area of your home in which your cat has normally spent most of his/her time. This is the space your cat has chosen and where he or she will feel most relaxed. During this getting-acquainted time, you and your family can ask any questions you may still have about the procedure. Prior to the administration of any medication, you will be required to sign a permission form to proceed with the euthanasia procedure. This is a standard form that is required by the state. It gives Dr. Rowell permission to proceed and it serves as verification that your cat has not bitten anyone within the past fifteen days. The euthanasia procedure is a sequence of two injections. With your permission, Dr. Rowell and her assistant will begin by clipping a small amount of hair from one of your cat's back legs. (With cats, an intramuscular injection is used at this point.) A combination of a sedative and a short-acting anesthetic is used and administered intravenously into the back leg. By using this technique, you and your family members can choose to stay in the front of your cat where he or she can see you and be comforted by you. The medication will allow your cat to relax and become sleepy in a short period of time. Full relaxation will occur within a few minutes in dogs and within 5 to 10 minutes in cats. When your cat is fully relaxed, the euthanasia drug will be administered intravenously. Because of the initial sedation, your cat will not feel this injection at all. This drug has been designed specifically for this purpose and works in the body quickly by first rendering full unconsciousness and then stopping the heart. Your cat will not experience discomfort at any time during the procedure. Upon arrival at your home, Dr. Rowell will explain the euthanasia procedure to you and any other family members who wish to be present. 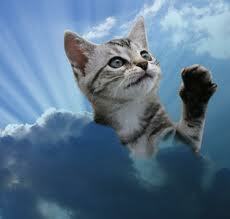 We use the highest quality drugs for our procedures so your cat will undergo a peaceful passing. 2. Clipping of hair on a leg to ensure visualization of a vein. and their heart will stop. cat's chest, check pulses and blink reflexes.